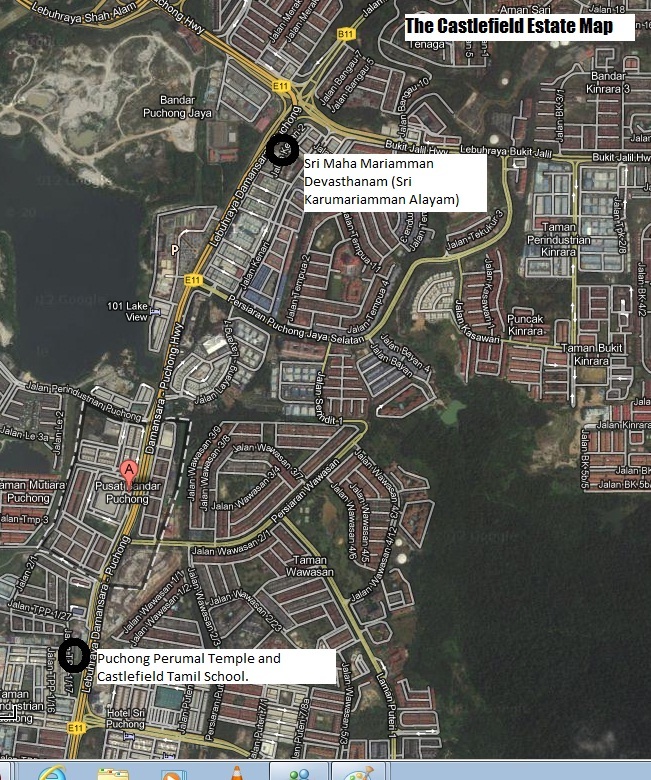 Malaysian Temples: The History of Puchong, USJ and Shah Alam: The Temple Story. 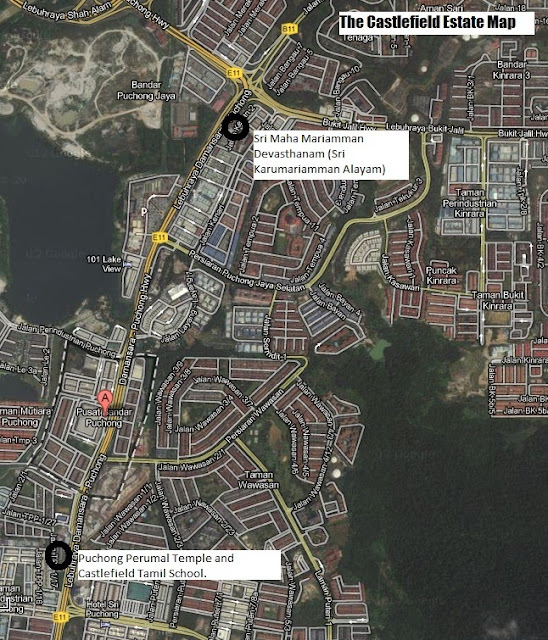 The History of Puchong, USJ and Shah Alam: The Temple Story. Vast tracts of rubber and oil palm trees once stretched from modern day Puchong to Shah Alam. The people of these estates shared a unique relationship.Any estates which organised temple festivals will see an influx of devotees from other estates and vise versa. These brave men and women walked and cycled miles from one estate to enother just to visit a temple or even watch a movie. Interestingly, movies were a regular affair in the Labuan Padang Estate back in the day and some used to cycle from as far as Castlefield Estate to watch a movie in Labuan Padang (modern day Taman Alam Megah). Please note that there were no highways or brightly lit roads at that time. Today evidence of these people and their lifestyle as a community have all vanished except for the last remaining temples which bear witness to this untold story. These temples have managed to survive the onslaught of rapid development. Within a decade or two, the entire landscape of both Shah Alam and Puchong has transformed into a concrete jungle of mixed development, much of which is still ongoing.Modern day Pusat Bandar Puchong was known as the Castlefield estate and Usj 25 was part of the Seafield Estate; though gone,she lives through the Seafield Temple refusing to be relocated and continues fighting a legal battle for its right to exist in the courts of law to this very day.As for Taman Alam Megah, it was then part of the famed Labuan Padang Estate and in the mid 90's the temple was demolished only to be relocated nearby where it now sites majestically bordering Putra Heights.The Ebor Estate has now become USJ Heights and the Ebor Estate Temple has been relocated to a new site. The Castlefield estate's actual size and boundaries may be unknown today, but we can clearly point out parts of Puchong which were once part of the Castlefield Estate due to the Castlefield Tamil School(which still bears the name) located next to the Perumal temple and the Castlefield Mariamman Temple, also known as the Karumariamman Temple. These heritage sites have managed to prevent the history of this landscape from fading away by staying put in their respective sites. The Karumariamman temple was first established by the PWD workers of the colonial era long before even the Castlefield estate came into being thus making it the oldest man made structure on this side of Puchong.Everything but the temple has changed and the 'Grand Old Lady of Puchong' sits watchfully over Jalan Kenari 11 as the face of Puchong continues to change as we speak, or should I say type? Lets hope she remains there for centuries or even millenniums to come silently bearing the torch of our ancestors with a story for all. Research on this topic is ongoing. Other temples will soon be added into this list. The history of Taman Alam Megah; The Temple story. The history of the Klang Valley: When Temples speak!